Could 3D Bioprinting be the Future of Reconstructive Surgery? 3D Bioprinting has revolutionized the world of tissue engineering and reconstructive surgery since 2004. Additive manufacturing techniques are used to create autologous biological tissues. In order to form a bioink, mesenchymal stem cells or differentiated cells are placed in a fluid hydrogel to form a bioink. 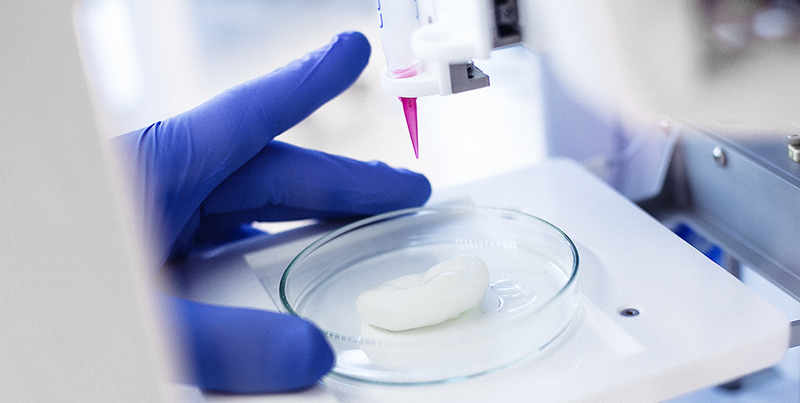 Tissue engineering has been revolutionized since 2004 by the emergence of 3D Bioprinting. In this approach, additive manufacturing techniques (microextrusion, laser-assisted printing, and inkjet printing) are used to create autologous biological tissues. Mesenchymal stem cells or differentiated cells are placed in a fluid hydrogel to form what’s called a bioink. The unique characteristic of 3D bioprinting is the cellular ink that is used, from which precisely shaped grafts can be produced. This technique differs from traditional tissue engineering in which a scaffold is first created and then filled with cells. On a microscopic scale, 3D bioprinting allows a cell-specific environment to be created with a conducive 3D structure. Cells are dispersed in the hydrogel, which contains all the extracellular factors required for their survival. On a macroscopic scale, the main advantage of 3D bioprinting is that it will allow the creation of personalized autologous grafts that perfectly fit the tissue defect and thereby increase the success of the reconstruction. Autologous grafts produced by computer-assisted manufacturing will be faster to implant and minimize donor site morbidity. The practical limitation in terms of graft size is the ability to create a vascular network. Once this limit is overcome, the production of “ready-to-implant” organs and autologous free flaps with a vascular pedicle will become possible.